Many offshore, deregulation and other proponents of business-as-usual trade rule claim that those who contest NAFTA-style trade pacts somehow oppose trade, as if there’s only one way of doing things. This tired old myth is easy to disprove. 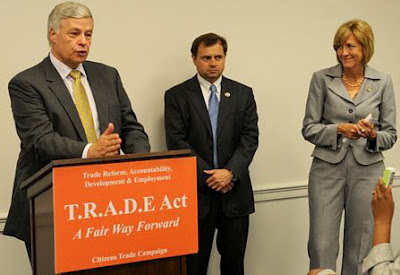 ORFTC supports a landmark piece of fair trade legislation call the TRADE Act, which has over 150 cosponsors in the final Congress; include the vast best part of House Democrats. The bill offer a way to help sure that future trade policy in fact profit operational people and strengthen the economy, as well as defensive consumers, the situation, public health and small farmers, both at home and abroad.